Hawker centres are scattered across the city and offer a glut of international food in one spot (note, this can make for difficult decision-making when it comes to what to eat). 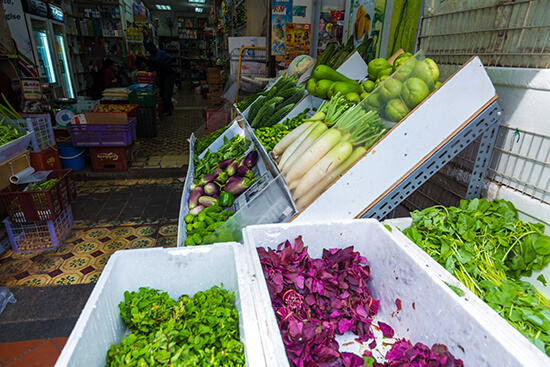 You’ll find Sri Lankan, Chinese, Korean and Thai stalls all huddled alongside one another, vying for your trade. Newton Food Centre is a good place to start for beginners. The open-air centre serves a vast range of dishes from rich Malaysian curries to Japanese ramen. The prices are slightly higher here, probably due to the volume of tourists it attracts, but you’ll find a warm welcome and delicious food from around the world. Visit at night for your evening meal and a more atmospheric (neon-lit) visit. 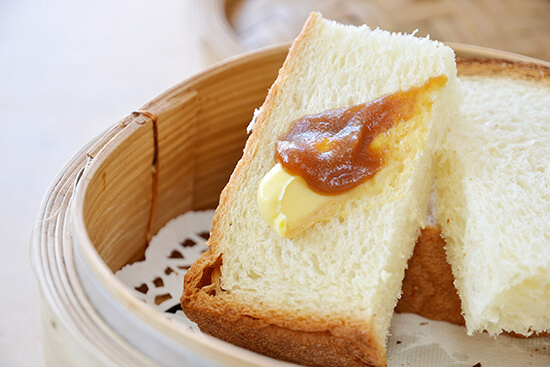 Don’t miss this Singaporean take on toast. Hear me out with this one – it’s worth it. Take two slices of doughy, white toast (crispy on the outside, lovely and light on the inside) and slather it in a creamy coconut jam so it oozes between the two slices. Variations can include a thick spread of butter or sugar too. Head to one of the many Toast Box (yes, an entire café selling the stuff) branches across the city for a cheap snack or dessert. Being a vegetarian, I didn’t actually try this one, however, everyone I met in Singapore said this is the dish to sample (it’s unofficially the nation’s favourite). Best made with meaty Sri Lankan crabs, the outcome is spicy, rich and filling. Mop up the thick, gravy-like sauce with a steamed bun; make sure you’re prepared for a messy dining experience. The hawker centres mentioned above are a good place to hunt down this dish. The wonderful thing about Singapore’s cultural combinations is that flavours from different countries have combined to create new dishes. 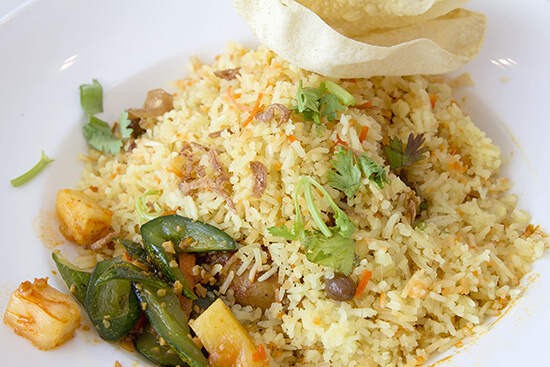 Nasi biryani is just one of these, mixing Indian and Malay styles in one. This fragrant dish is packed full of aromatic flavours, with saffron, cinnamon and fiery chilli. Chicken or mutton often accompanies the thick sauce, but I opted for a medley of fresh vegetables. Mop it up with another Singaporean specialty: roti prata, a fluffy, griddled-fried bread. Ordering coffee from a Singaporean café can be a complicated experience. Forget the lattes or flat whites we know, you’ll get a coffee black (kopi-o), coffee white (kopi), or coffee white with sugar (kopi-c). Problem is, they all sound incredibly similar, especially while you’re shouting among other customers, competing for attention. Once you get it though, the coffee is rich, nutty and full of flavour. 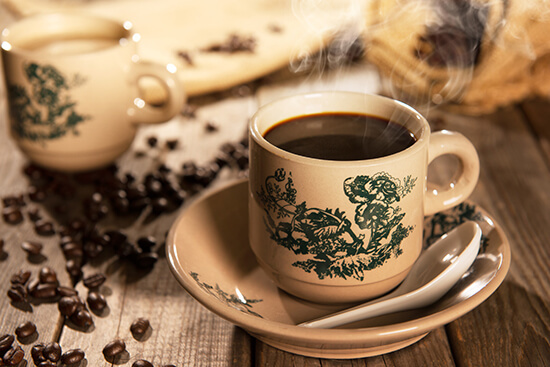 Kopi tarik – or literally ‘pulled coffee’ – is another local specialty, where the coffee is poured from cup to pitcher and back again repeatedly to ensure the ingredients are well mixed (think Moroccan mint-tea style). You’ll find the flavour dark and intense, and a good way to get your morning caffeine shot. Fancy a city break in Singapore, or stopping over en route to Australia? Make an appointment with one of our Travel Experts today and we'll tailor make your perfect holiday.